SHANGHAI, Nov. 9, 2018 /PRNewswire/ -- On November 8, as one of the main supporting events of the China International Import Expo, the Innovative Design Forum - "Better Design Better Life" was held in the National Exhibition and Convention Center (Shanghai). 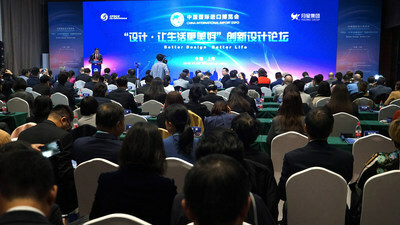 The Innovative Design Forum -- "Better Design Better Life" was held in the National Exhibition and Convention Center (Shanghai). The "Shanghai Declaration" that "Respecting Intellectual Property & Stimulating Original Power" issued by the forum has attracted much attention. On one hand, new technologies, new designs, and new products are emerging one after another. On the other hand, plagiarism and imitation are becoming increasingly rampant, which have severely hampered the enthusiasm of the original creators. In this world-oriented innovation event, the declaration undoubtedly hurt the pain points of the global industry, and also made the audience who participated in the China International Import Expo have more thoughts. The Forum, under the auspices of China Furniture & Decoration Chamber of Commerce (CFDCC), jointly organized by Yuexing Group and China Furniture & Decoration Chamber of Commerce (CFDCC) - Designers Committee, and co-organized by DeTao Group. Top design innovation platforms and well-known design masters, industry organizations, design institutes and leading enterprises from China, the United Kingdom, Germany, France, the United States, Italy and other countries jointly proposed the Shanghai Declaration - Adhere to the original design, combat copying and plagiarizing, promote exchanges and cooperation, and create a better life together, practice the new mode of property rights protection, property rights creation, and legitimate use of property rights, promote international cooperation in service trade, accelerate the transformation and upgrading of industries, as well as achieving quality, efficiency and impetus transformation. In the view of Ding Zuohong, CPPCC Member, Member of standing committee of ACFIC, and Board Chairman of Yuexing Group, that the intellectual property, as a strategic resource for enterprises, industries and even the countries to improve their core competitiveness, have already highlighted an unprecedented important position. This declaration is not an empty talk, it was the voices and expectations of this industry. As one of the leading companies in the industry, Yuexing Group took the lead in exerting strength. Ding Zuohong said, "In the future, in the commercial complex projects of Yuexing Group, such as Yuexing Furnishings Mall and Global Harbor, we must strictly control and prevent the counterfeit and copycatting products, and hope to promote the protection of intellectual property rights of the entire service industry." Meanwhile, in order to service the full industry chain of "Better Life", join all intellectual resources together, and build a sharing mode of resources of design, manufacture and consumption globally, the first international trade platform focus on design service -- "Trading Center in Design Service (Furnishing)" will be located in Yuexing Furnishing Mall in Putuo District, Shanghai. In order to stimulate the original design, the forum established the "AoTu Design Award". The "AoTu Design Award" is divided into nine categories including furniture design, interior design, soft furnishings, home accessories, smart technology, lighting design, art installations, exhibitions, and materials application, which means "the nine ways to meet a better life". Each category has five awards: "Gold, Wood, Water, Fire, and Earth". This award is committed to building an open source global designer sharing platform, through design-driven innovation, industry integration, model innovation, and to achieve the global sharing mechanism of original design intellectual resources, allowing design, production, and consumption resources to be shared globally. As the host of this forum, CFDCC said that the relationship between design and life is like the inseparable two sides of a coin. Their common foundation is to satisfy human needs and the goal is to benefit mankind. Life is the foundation of design, providing sources and materials for design; design is the need of life, bringing convenience and beauty to life. The "AoTu Design Award" will be promoted globally in the form of exhibitions, forums and events, and will stimulate global original design power through efforts to fully respect and protect intellectual property rights. The first "AoTu Design Award" will be announced in March 2019 at the "China International Furniture Fair" in Guangdong Province. Two professional masters was also invited to the forum to give keynote speeches. Mr. Hartmut Esslinger from the United States, is the father of international industrial design. He is the founder of Apple's Design Language, a lifelong friend of Steve Jobs and also the founder of the world-renowned design company Frog Design. He has won the e U.S. National Design Award Lifetime Achievement Award, the Rowe Lifetime Achievement Award, the Design Europa Lifetime Achievement Award, the WDO World Design Award, and other international design awards such as Red Dot, IF, and IDEA. Esslinger gave a speech on "Designing for a Better Life" from the perspective of design innovation. "Designing for a better life is the things that we do today," said Esslinger, "It will benefit tomorrow significantly." He also thinks that China has a lot of great designers, and hoping to work with Chinese designers on many great projects. Peter Mackey, who is a Director of Chapman Taylor, also gave a speech titled "Innovate Architectural Design Concept, Presenting a Beautiful Living Space" from the perspective of good relationship. He is the interior designer of the Yuexing Group's Shanghai Global Harbor Project. "Without Shanghai Global Harbor project in 2006, and without the support from Yuexing Group, Chapman Taylor won't go this far in China," said Peter Mackey, "Shanghai Global Harbor is a great success which was visited by over 500,000 people during the first week after its grand opening. We could say that designing is the pursuit of beauty, but Global Harbor is the model of creating a better life." In the panel discussion, as the host, Wang Min, former Dean of School of Design at China Central Academy of Fine Arts, talked with Ding Zuohong, Chairman of China Furniture & Decoration Chamber of Commerce (CFDCC), Wang Yongping, President of China Commercial Real Estate Association, He Mai, Leading Designer in Germany, Yu Zhenwei, Deputy President of Shanghai Institute of Visual Arts, Yu Jingyuan, Chairman of Mengtian Group Co., Ltd., and Wu Xingjie, CEO of AUPU Home Style Corporation Limited and others. They have conducted in-depth analysis and discussion of future trends of the content and future development of "Respecting Intellectual Property & Stimulating Original Power". All the guests in panel discussion agreed that China's consumption has been upgrading, from quality to brand, and now "taste". Therefore, elements of innovation must be added in many aspects to meet the needs of this new era. Also, the protection of IPR must be enhanced, which is significantly important to not only China, but worldwide. According to the statistics of the World Intellectual Property Organization, the trade volume between countries through the licensing trade based on "patent technology" has increased by several times every year. The "protection of intellectual property rights" emphasized in the design innovation forum is a strong support for promoting international cooperation in service trade.